Hey, friends! 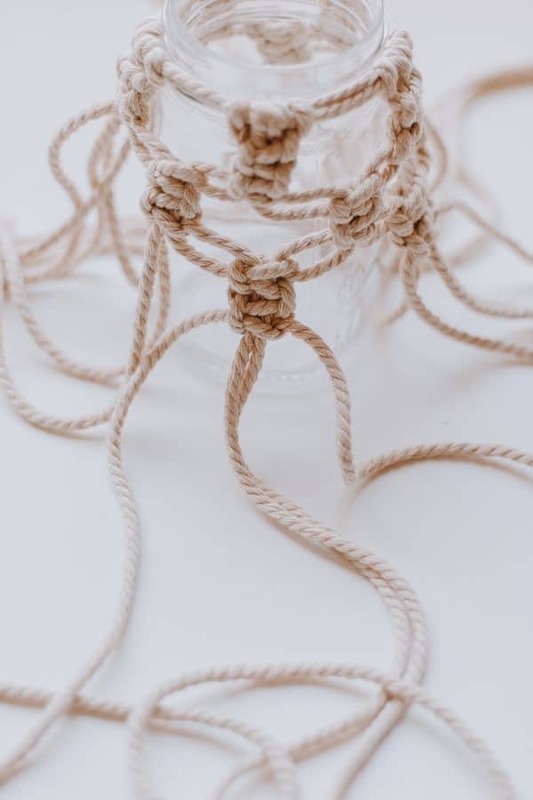 How are we doing with our macrame projects? Did you have any luck with the macrame feathers or the macrame wall hanging? 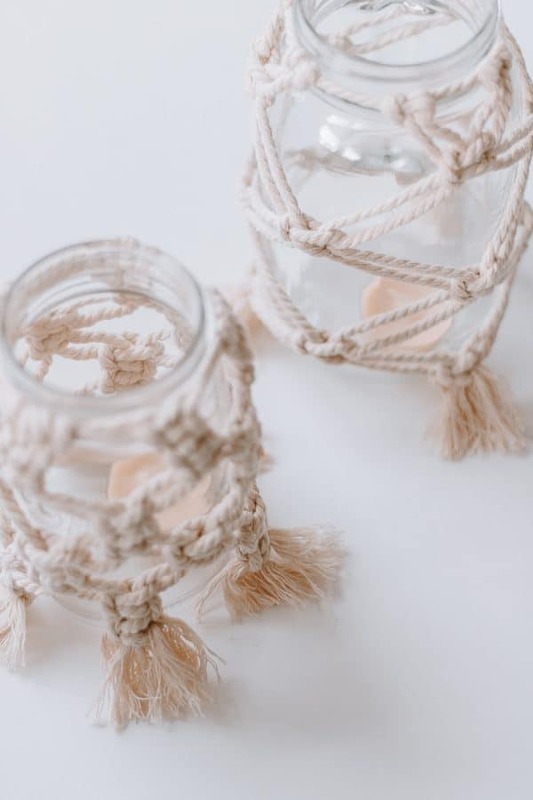 Moving right into our next project for Macrame week – these super cool, earthy looking macrame mason jars. 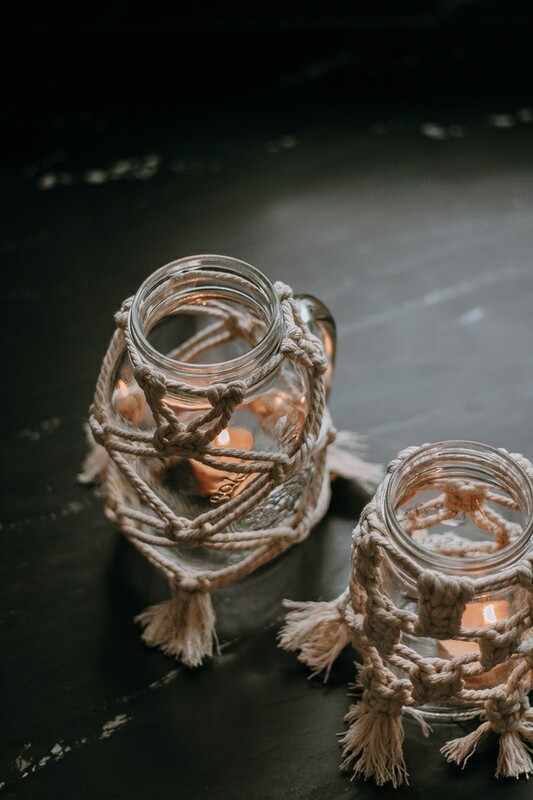 I just love mason jars, don’t you? I collect them. 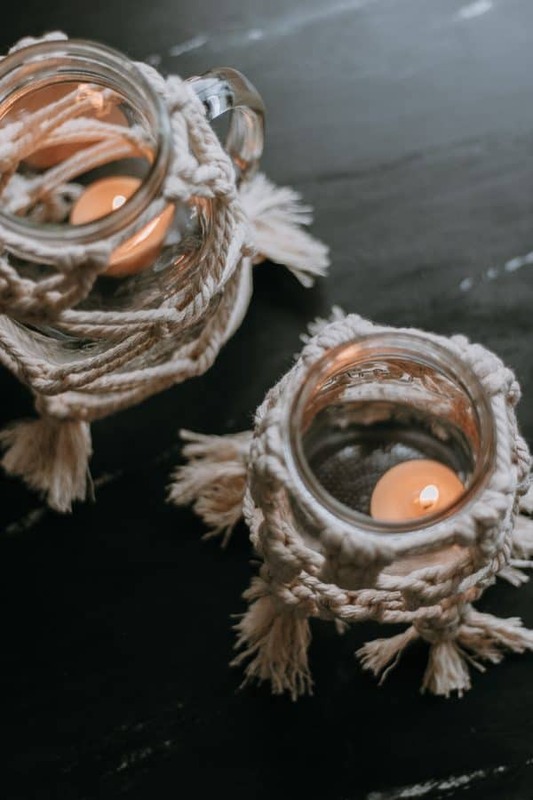 I use them for storing little bits and bobs (like coins, my sewing pins, my daughter’s hatchimals – #truestory), but I also just love displaying them here and there. There is something very homey about a collection of beautiful mason jars. 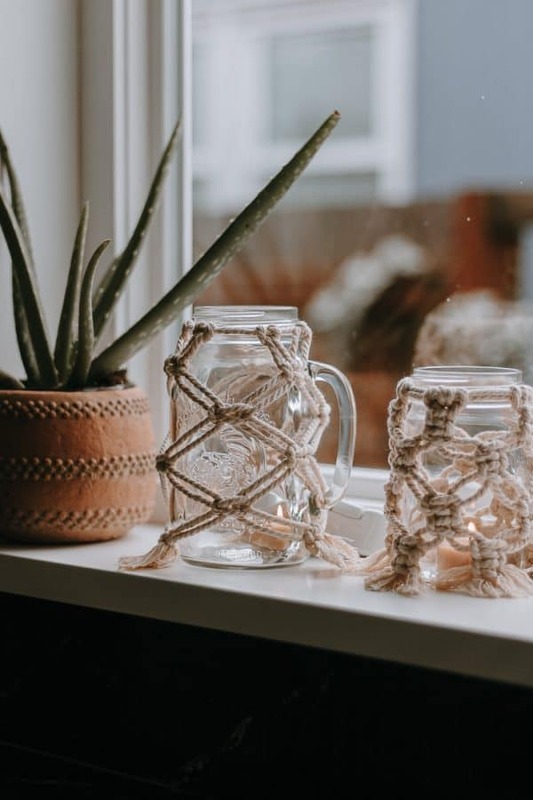 If you are looking for a way to slightly kick them up a notch or bring in some boho vibes with your mason jars – then you will love these macrame mason jars. Mason Jars – I had one larger one with a handle and one regular size. I cut the cords all the same lengths for both jars – you might have to cut off some excess on the regular one. It’s always better to have too much then too little! There are two jars here and each have a slightly different pattern. 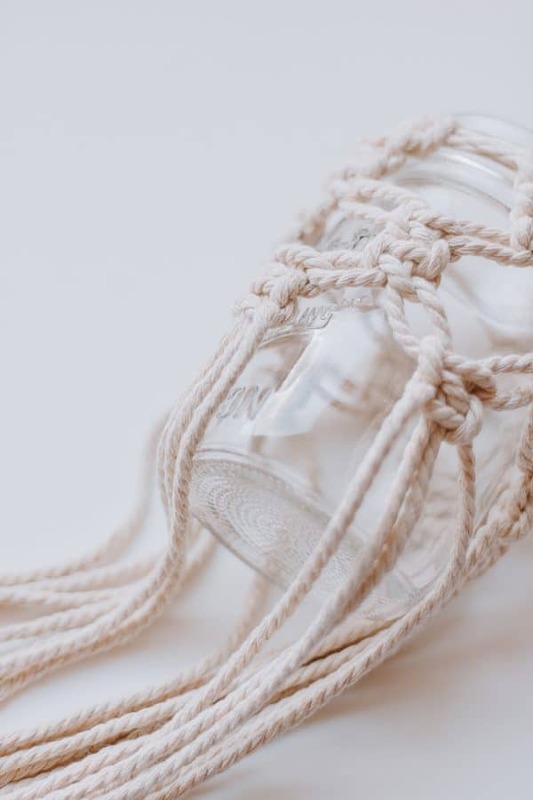 The larger mason jar with handle (known as Larger in this tutorial) – Pattern is one alternating square knot all the way around. 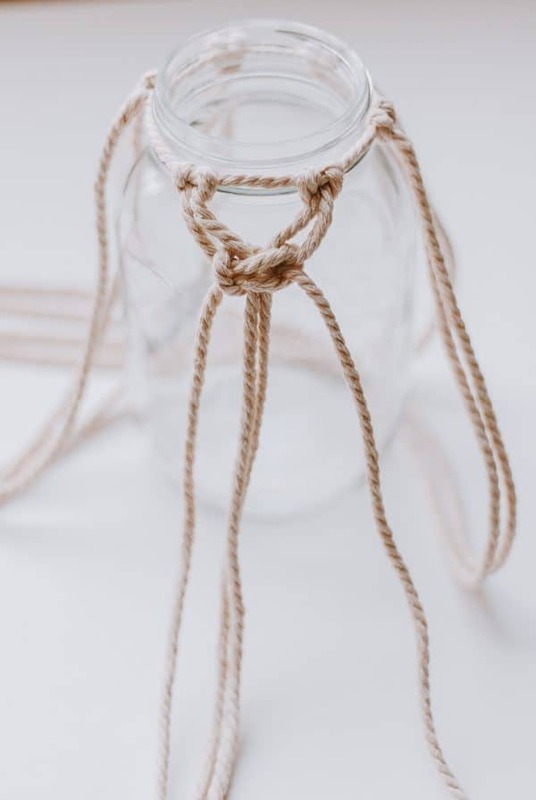 Regular Mason Jar (known as Regular in this tutorial) : Pattern is 2 square knots followed by sets of 2 alternating square knots all the way around. 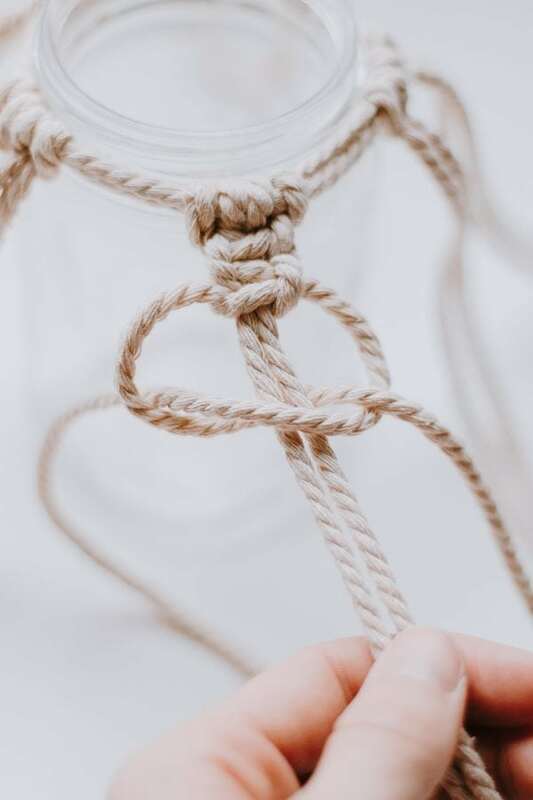 Regular : Take two of your cords and wrap them around the lip of the jar – secure them with a single square knot. 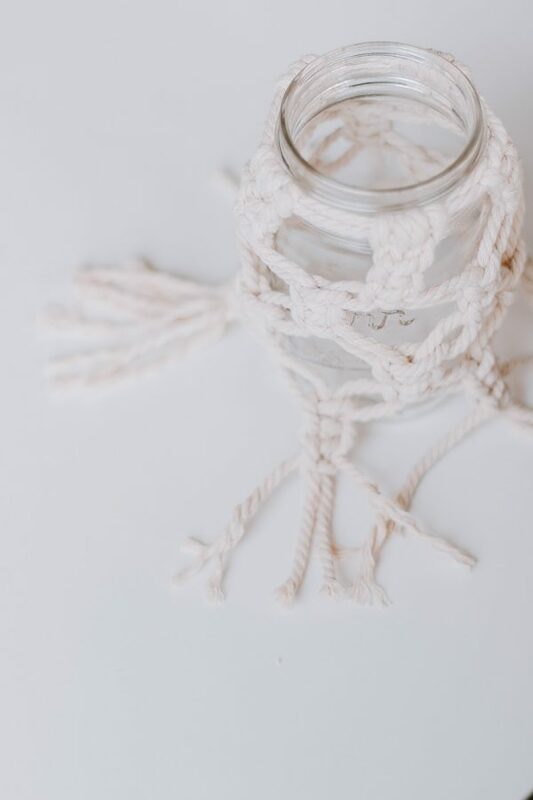 Larger : Take one of your cords and wrap them around the lip of the jar – secure with a regular ol’ knot. Refer to Basic Macrame Knots to see how to do a reverse lark’s head knot. 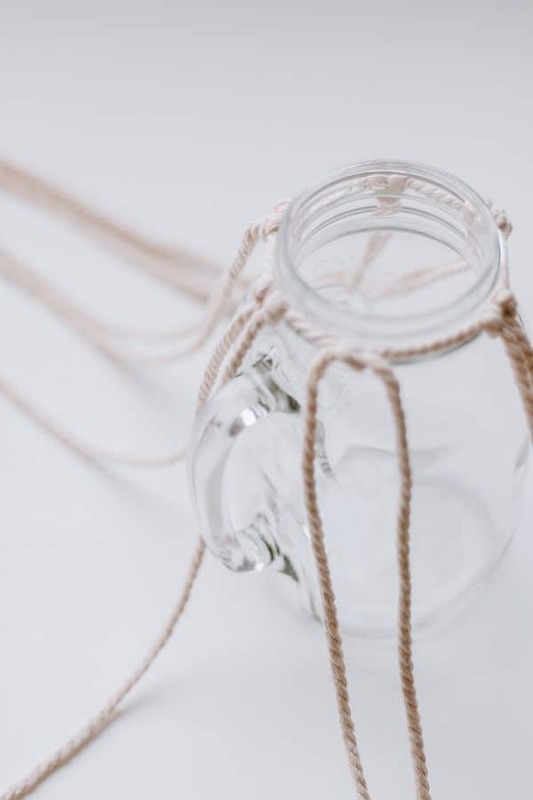 Regular : Take the rest of your 6 cords and attach them to your jar using reverse lark’s head knots. Regular : Slide your reverse lark’s head knots together in pairs spaced evenly all the way around your jar. Larger : Evenly space your lark’s head knots around your jar. Regular : Make 2 square knots all the way around. 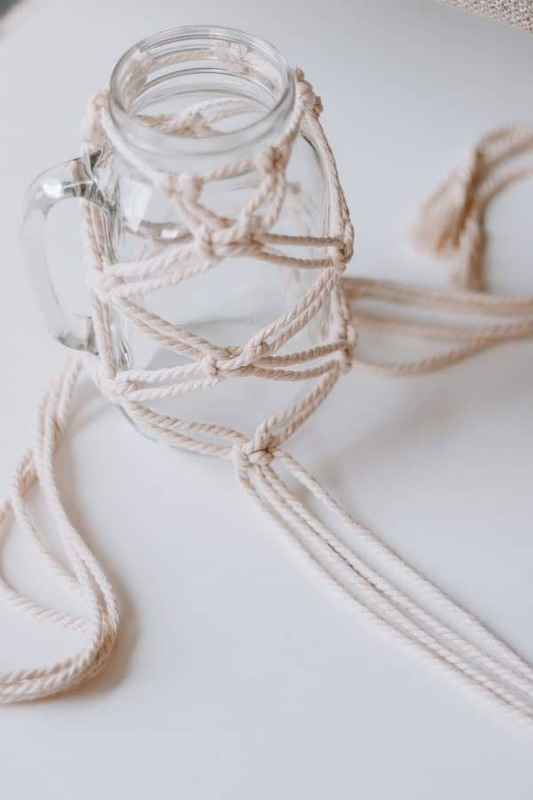 Larger : Make a row of 1 alternating square knot all the way around the jar. Regular : Now make a row of 2 alternating square knots. Continue these rows of alternating square knots until your get to the bottom of the jar. Larger : Continue with another row of alternating square knots all the way around. Do this until you reach the bottom of the jar. Tip : Just work around the handle if you have one by making your knots around it or through it. 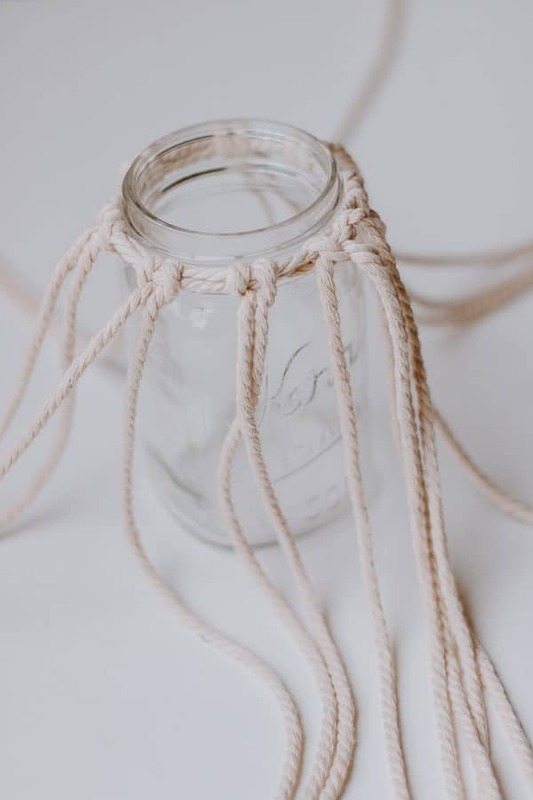 Regular/Larger : When you get to the bottom of the jar, cut off some excess rope but leave a bit there and comb them out for a fringe look. 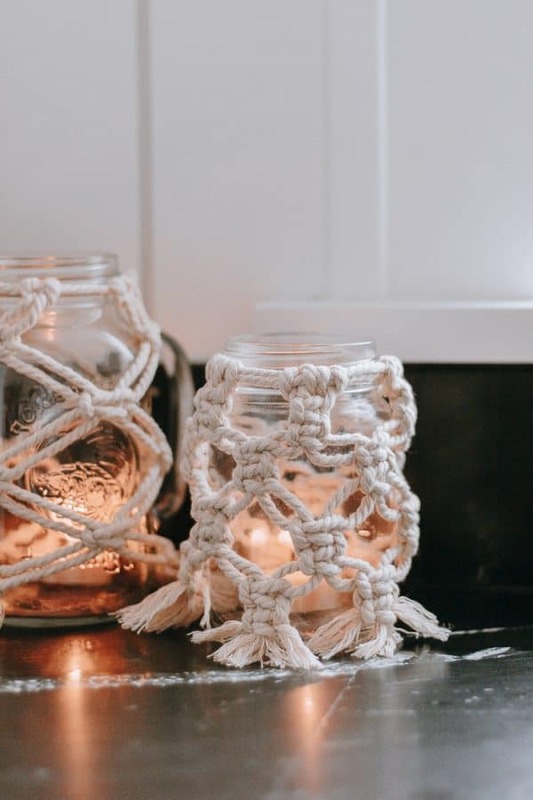 I put some tea candles in my macrame mason jars for a nice, pretty glow! I wanted my jars to still be visible so that’s why I chose spaced out, alternating square knots. 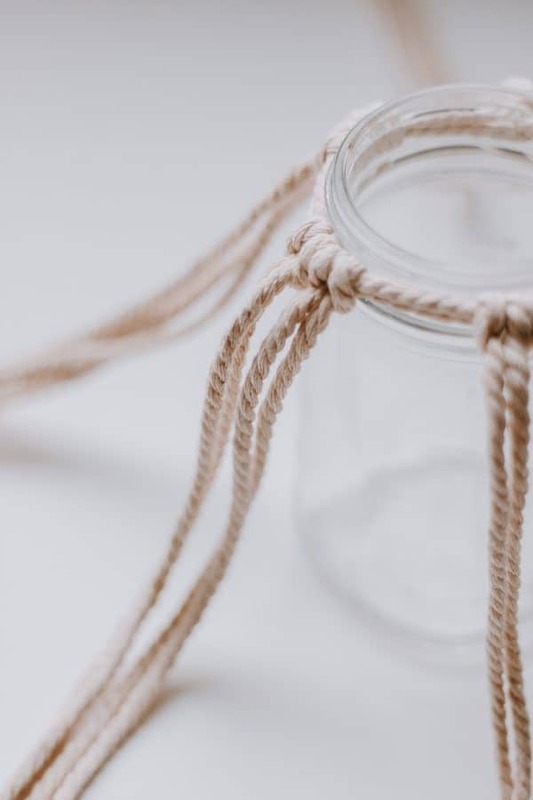 However – if you really wanted to cover the whole jar, you could use smaller sized rope and make really tightly weaved alternating square knots. Wouldn’t this be a cute favor or housewarming gift? Fill it with something good obviously, but the presentation is certainly cool! There’s still one more project to come! And tell me hows it all going in the comments! Pleeeaaase ….